Former U.S. Senator Scott Brown speaks at a talk hosted by the MIT College Republican Club on Tuesday evening in the Wong Auditorium. Brown, the first Republican elected to the U.S. Senate from Massachusetts since 1972, focused mainly on the need for more moderation and compromise in Washington based on his experiences there. 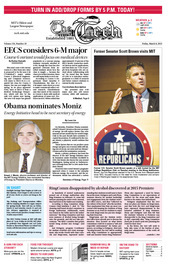 On Monday, President Obama nominated MIT’s Ernest J. Moniz as the next secretary of energy. He will replace Steven Chu, who announced last month that he would resign. Only in the past decade have scientists occupied the position. If confirmed by the Senate, Moniz, a physicist, would continue that pattern. As hundreds of excited sophomores poured out of Kresge Auditorium after Ring Premiere on February 15, some left without enjoying the entire event. Instead, they had been in the bathroom vomiting.